Made to hold the earpiece in a position so that there are no pressure points. 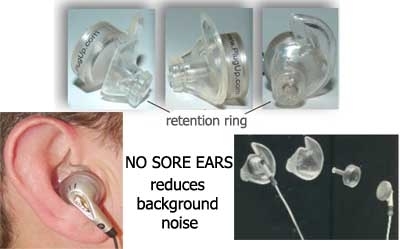 Its flexibility allows for a better fit and its ear canal shape will seal and keep the earbuds in place. Unlike commonly seen holders that are thick, with very short and narrow ear canals, this design more closely resembles the shape of the ear. ** Note- for use under a helmet, make sure the earbud will fit your ear before ordering. Made to hold the earbud in a position so that there are no pressure points. 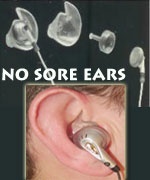 Its flexibility allows for a better fit and its ear canal shape will seal and keep the earbuds in place. Plastic cup will hold the standard round headphone. Fits the new Iphone earbuds.